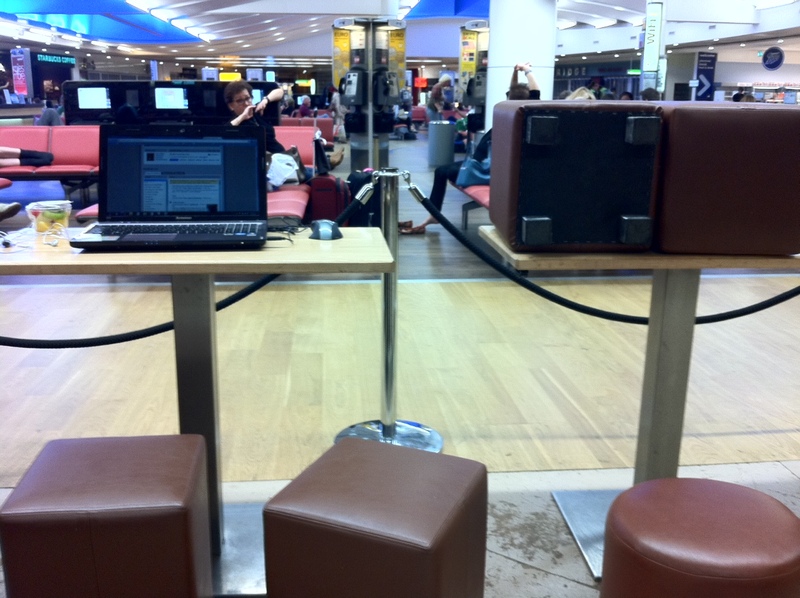 Thanks to a very unusual delay on Singapore Airlines’ part, I was facing a 6 hour wait at Heathrow Airport. With the ‘We have it so good‘ realizations of late, I was pretty pleased with my own response to the situation. No ‘playing victim’, no tantrums – my energy was focused on finding a place to work out of. Thanks to poor infrastructure, the only place to work out of was outside the ‘EAT.’ cafe. So, I got myself a customary snack and settled on my temporary workstation. An hour later, I had an employee request me to leave as they were shutting down. I requested him to let me continue to browse as there is no real fence or barricade separating the cafe seating and the rest of the sitting area and I explained to him that I would jump back in as soon as he was gone anyway. He relented, unhappily. Soon, I had another of his colleagues come and say ‘Sir, we’re closing. Please..’. As I was on a Skype call then, I decided to move out. They did their 30 minutes or so of cleaning and left the place. And of course, I was back right after they left. Protocol had taken over. They had done their duty, ticked their check lists and had gone home. They didn’t really care that the procedure was brain dead in the first place. – Empowerment is extremely important in the hospitality industry. Blind adherence to protocol doesn’t help at all. EAT. lost a lot more than it could possibly have gained from their response to the situation. – When you have something, share it. EAT. could have earned a lot of goodwill today by just allowing all passengers boarding the delayed flight to access their ‘desk’ area. Protocol ruined it for them. – It’s important to pick your battles. I’m glad I retreated when the 2nd employee asked me to move. I could have been stubborn (I have been in the past, often..) and then spoken to their superiors etc etc but I would have just lost both my energy and my happiness. Not worth it. – Technology gives us a tremendous amount of control over our productivity. Thanks to a smartphone and tethered internet, I’m just ploughing through my weekend task list as if nothing happened. It’s amazing how far we have come. And thank god we have the power to choose our response to situations that life throws at us. Being human has some really amazing advantages..
Mark was about 21 and thanks to a unique set of circumstances, had been given the opportunity to run an under performing factory. The factory was traditionally rated low in the yearly inspections and when Mark learnt of the state of affairs, he decided to change that. The challenge, however, was that the next inspection was in 3 weeks. All inspired, Mark began working feverishly with his team to get all the machines up to speed. Within a week or so, they had cleaned up all machines and ensured they were in top working condition – all machines, except one. So, they began working on that, but, despite their best efforts, it just refused to work. They still persisted but the machine would not budge. At their wits end the night before the inspection, they gave up. They applied some extra grease and were hoping the inspector would be impressed by it’s looks and not ask them to demonstrate it’s working. The next morning, their inspector came in. He was originally from France and spoke with a distinct French accent (I remember him saying he distinctly remembers the man and his accent). He walked around the factory asking them to demonstrate the various machines while he scribbled his assessment. And then, he came to our problem machine and asked them to switch it on. And of course, it didn’t work. ‘Let me take a look’ – he said. Mark told him resignedly that they had tried everything and that it just wouldn’t work. But our inspector decided to take a close look. After carefully looking around and muttering to himself, he asked for some tools and tweaked some parts. ‘Switch it on’ – he said right after. And voila! It worked perfectly! ‘And after having fixed thousands, wouldn’t you expect me to be able to fix this one?’ he asked. ‘Don’t be impressed by experience, Mark.’ – The inspector said with a smile before he bade goodbye. He remembers the story with great fondness to this day. I was told this story as I was marveling at some of the things he was doing naturally on the project. And when he told me the story in response, I didn’t really know what to make of it. What else do you get impressed by, after all? As a 22 year old in a whole new world, I find myself watching in awe thanks to many past masters who just ‘own’ what they do. However, I do find that the ones I look up to and admire are the ones willing to pass it on, to encourage, to nurture, to stay positive and calm through difficulties and to help others around them grow. And that doesn’t necessarily come with experience but with care, empathy and a desire to help others grow. He met her at a friend’s get together. They hit it off. He asked her out for coffee. Over coffee, he realized that she loved reading mystery books too. Oh, she was also an avid sports person. They had so many similar interests! Their relationship was made in heaven. 6 months later, he sat on his park bench and wondered why he got into it in the first place. He was introduced to him at an event for entrepreneurs. He noticed they had similar styles and similar passions. As they got talking, they realized they had both been looking for a partner to start up with. He quit his job and they started a company together. 6 months later, he was back at the park bench..
Styles and approaches are often confused with principles. The question – ‘How are you two so close?/How do you two work with each other? You seem so different?’ always refers to the style/approach because that is what is most evident. It is pretty easy to spot if he/she is pessimistic/quiet/reserved/loud/confident etc. It is, of course, much harder to see that he/she believes in family, integrity, humility versus money, power, fame. Disagreements on principles are hard to reconcile. If you are not aligned on ‘learning’ as a principle, you are probably never going to approach or reflect on a situation the same way. If you disagree on ‘books’ as an approach to getting prepared, that can still be solved because your differences will likely make the learning experience richer. Approach/Style is a bit like the personality of a celebrity. It tends to ‘wow’. Principles/Values are the boring character building stuff. And as it is with most things in life, it is up to us to choose what works for us. Yesterday, I was reminded of something I learnt when on project in the Middle East. I was fortunate to be part of a massive change effort where we helping bring together 3 companies. As it is the case with change, there is always a lot of chaos and chaos is always stressful. Never mind chaos that is certain to last atleast a year. One of the steps we took was to build a ‘toolkit’ for the process. This was not to meant to be a process manual but more as a guide for the leader of (huge) groups that were undergoing the change. And here is where I came in – to help with the building of the toolkit and to assist a wiser head. We spent a couple of months building this tool. It took a lot of effort to ensure most tiny details were in place – every sentence in the package had been read, re-read and agonized over. And soon, it was ready for it’s users. I found that an odd starting thought but very soon, I realized the significance. As soon as members of the team received it, they had a thousand ideas on little things that could be changed. A few made sense but the remaining didn’t as they had been agonized over and we had consciously decided against it. Thank god they committed to making it work! I learnt something very significant that day. When we see something that that has been designed for us, we immediately like to stamp our own authority, our own identity on it. We feel the burning need to customize it so we connect with it emotionally. In the process, we often forget that the creators have probably spent hours thinking if the customizations make sense at all. And besides, once we start using it, we might even see their point of view. All that is irrelevant at the first instance. It is easy to want to stand out. Learning to fit in first, and then stand out comes with a dose of maturity. Thanks to that experience as a ‘creator’, two things have happened. These days, I am a lot more patient when I’m handed a new tool. I find myself spending a great deal more time trying to understand why it is the way it is before making a judgment and then, making a change. And also, I find that I am a lot more patient with those who adopt tools I have created as well for I understand their natural instinct a little better than I did previously. ‘Commit to making it work.’ Very very powerful. I go home every 4-6 months to a loving family. And there are few things that equal the joy of being at home at the end of the day. When I think of home and family, Kuppamma always features. I realized that when I saw her wave with her characteristic smile on Skype while talking to family during the weekend. ‘Kuppamma’ (an unusual name for all those who don’t have roots in Southern India) has been our maid for 22 years now. In reality, she has been a lot more than that. And my Grandmother has demonstrated that in great measure over 22 years by ensuring Kuppamma always felt loved and had a sense of belonging in our family. Kuppamma, in many ways, is an incredible being. To all my friends, Kuppamma has been an ever present. She has watched all of us grow up (she started working for us about the time I was born! ), served us delicious dosas when we were hungry and ensured we had our share of delicious lime juice with ice after tiring hours of games. And when I think of it, Kuppamma has taught me many things implicitly. She always shows up with a beaming smile – no matter what. She is not without her theatrics and idiosyncracies (like all of us.. :)) but I’ve never seen her sustain a frown for long. And that’s admirable. She started working for us as a mother of a 1 year old with a permanently drunk and abusive husband who left her in due time. She used to work in 4 houses trying to maximize her earnings. My Grandmom convinced her to work for us and assured her she would have her meals covered. That was a big deal for her as she used to practically starve so she could take her portion home for her son and her ageing father. The moment my Grandmom realized what was going on, she saw to it Kuppamma had more than her usual share so she could take food home and not starve. Over time, her life became intertwined with ours. My grandparents sponsored her son’s education, gave him odd jobs once in a while so they had more income and gave her ageing dad odd jobs as well. All the while, Kuppamma worked hard, showed up, smiled, cared and did all she could to make it all work. All our old electronics went to her, of course. If you meet her today, she would probably talk excitedly about her son’s work at BMW’s factories or about her flat screen TV. She’s a different woman now. But, when we moved from being 10 minutes away from her place to a good 30 minute commute, she didn’t think twice about sticking with us. Of course, she’s older, slow and works lesser hours. But, she’s still tenacious, persistent, warm and cheerful. My grandparents have made a big difference in Kuppamma’s life. God knows how things might have turned out for her otherwise. We recently met another of our old maids who also had similar circumstances that didn’t end nearly as well. And that got me thinking..
We are all not born equal. It is a fact of life. What is ‘normal’ for me is not normal for ‘Kuppamma’ or many others like her. She did not have a maid to help around in her house, for starters. All this privilege comes with an enormous amount of responsibility. If you are reading and comprehending this, you have access to a computer and internet. You probably even have a nice little laptop of your own or maybe you are affluent enough to afford a phone you can read this on. Oh, and did I hear us moan? What was it about? A bad boss? A tough module? So we have jobs that pay us well now? And we can afford good education? We don’t need to starve to ensure our family members get food to eat. We don’t have any basic worries. Yet, can we all say with utmost conviction that we are doing all we can with all we have? That we are staying positive, showing up, smiling, thanking life for all it has given us? That we are working hard and bringing ourselves to work? That we are innovating, creating great things that could change the world? That we are, at the very least, sharing our joys and successes? Or that we are doing all we can to become great parents and family men and women who are shaping the youth of the future and helping the Kuppamma’s along the way? Can we look ourselves in the mirror and unflinchingly say that we are doing all we can to be the best version of ourselves? Or are we stuck in a self serving loop with the singular aim of being the richest discontented person in a graveyard? Or worse.. To live with the aim of being ‘satisfied’ – akin to wanting to eat good meals without ever thinking of how we could serve the rest of the world and help the many who don’t have access to the good meals we get ‘satisfied’ by? Because you see, the most inspiring thing about Kuppamma is that she has worked hard, done all she could with she has and given life her all. She has achieved extraordinary things for herself and the people around her given what she started out with. In essence, she has become the best she could be..
How many people can you and I say that about? And most importantly, can we say that about ourselves? I am proud to be associated with her. She is a reminder that there is inspiration all around us. When I was growing up in Chennai, my Mom took me (very often) to Lending Library’s. I remember her first favorite haunt – a ‘Balaji’ lending library that had a small collection, then a ‘Ramona’ that had a slightly bigger collection and finally ‘Easwari’ that had the biggest collection. The haunts changed but the habit remained – I continued to tag along. Growing up with these libraries made a huge difference to my life as a kid – I felt at home with the English countryside thanks to a certain Enid Blyton and always felt driven to be adventurous and daring thanks to the adventures of the Famous Five, the Secret Seven and the Five Find-outers among others. And I think, of all the sources of inspiration, the full ‘unread’ book shelves were a big one! I loved finishing up a shelf and classifying it as ‘read’. Over time, I lost touch with libraries and bookshelves. I realized I was at home reading novels but couldn’t get through books of a more serious nature (history, biographies, self help, management etc) that required more attention to detail. So, I stopped reading.. until a wiser friend introduced me to the world of audio books. And to get me started, he gave me about 50 to get through. 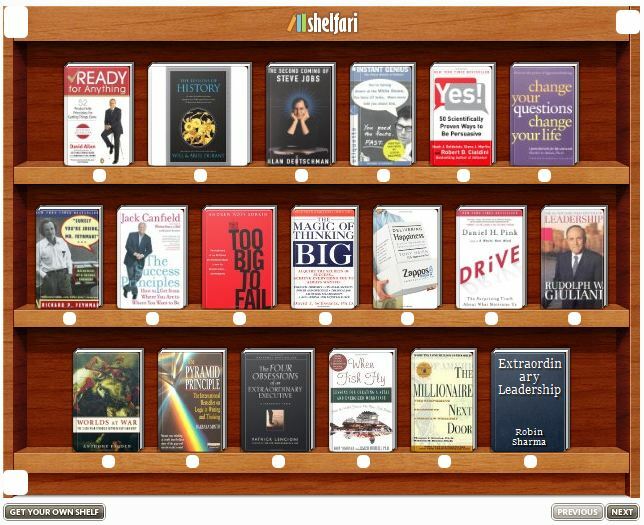 In the age of ‘virtual’, I decided to create a virtual ‘read’ bookshelf of my own. And that inspires me to no end as well. Every time I hear about or read a book, I can’t wait to add it on to my bookshelf, and every time I do, I can feel the endorphin surge. Bookshelves have a lot of magic. They inspire more creativity, joy, thoughts and ideas than they are given credit for, really. I hope you take time to build your own bookshelf – virtual, or real. Bookshelves, over time, have changed my life. Who knows, they might just change yours too.. The 8 best housekeepers at Disneyland had 1 thing in common – they had the exact same ‘ritual’ after they finished cleaning a room. They would lie on the guests bed and turn on the ceiling fan. Because this is the first thing a guest would do. They would walk into the room, flop on the bed and turn on the fan. If dust comes off the fan, then no matter how clean the rest of the room is, the guest will assume the room is as dirty. To these great housekeepers, a hotel room wasn’t just another chore to be completed. It was a world, a guest’s world. When they cleaned the room, they looked through the guest’s eyes and imagined how the world would look. After spending a week working on a spreadsheet that became steady complicated, I found myself losing track of what the purpose of the sheet was. It took some help and a lot of stepping back to get back on track. And I was struck by how powerful making a habit of this would be.. To ensure I approach what I do with the end in mind – just like the star housekeepers! 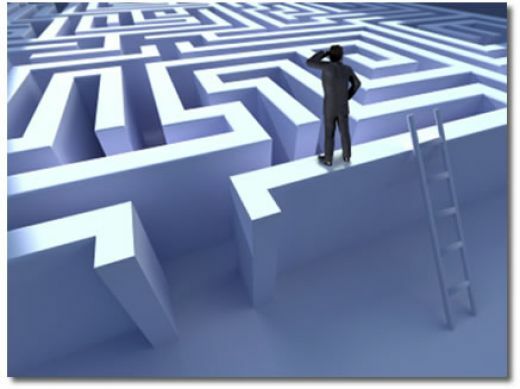 Here’s to approaching tasks by ‘beginning with the end in mind’ this week!